We are dedicatedly engaged in trading a commendable range of Eye Gel. Our seabuckthorn under eye gel for relieving and reducing dark circles and wrinkles contains the goodness of Seabuckthorn leaf extract which revives skin with regular use. We are noteworthy entity, engaged in manufacturing, exporting and supplying premium quality range of Carbomer Gel. - Used to make your eyes more comfortable when they feel dry. Genteal 0.3% Gel is used in the treatment of Dry eye disease.Genteal 0.3% gel is an artificial tear and moistens the surface of the eye (including artificial eyes) in the same way as natural tears. 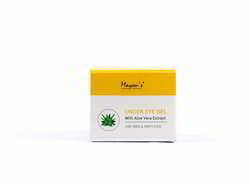 Owing to our in-depth industry experience and precise knowledge of this domain, we are offering an outstanding assortment of Under Eye Gel. Vaipani Under Eye Gel reduces dark circles and puffiness around the eyes. Strengthens the connective tissue. reduces skin reaction to UV damage. Improves blood microcirculation. This gel reduces the proteolytic breakdown of the collagen and reduces the presence of free radicals. Snug under Eye Gel contains a synergistic antioxidant combination which helps to protect the delicate eye area from oxidative stress, while targeted actives revive under-eye skin and helps reduce the appearance of puffiness. Under eye dark circles, puffiness and deep wrinkle correcting gel.